It’s one thing to be lucky enough to have a magnificent 18th century pedimented doorway on your home – but another thing altogether, quite amazing really, to have three! Built in 1698, our home was added onto and “improved” in the mid 18th century by replacing the old diamond leaded casement windows with double hung 12/8’s. 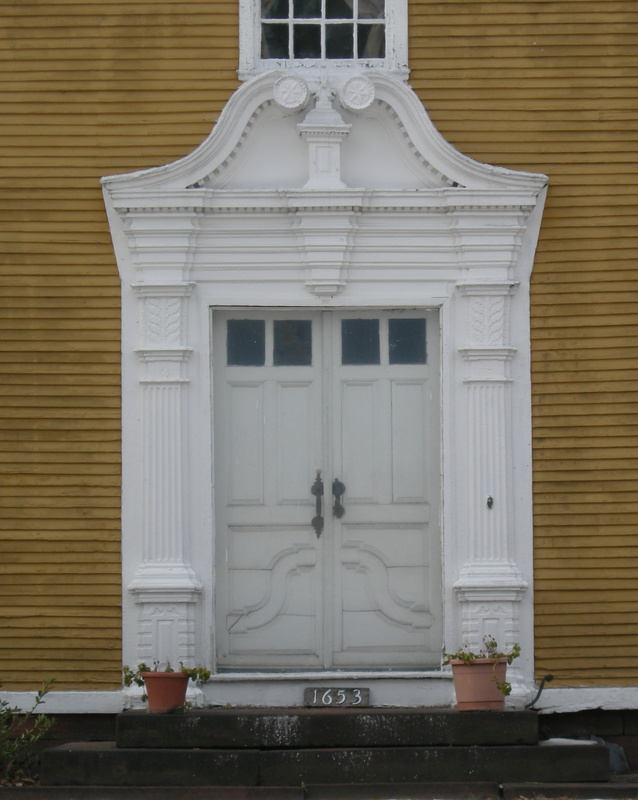 Two doorways were added at the side and trimmed with triangular pediment doorways with carved rosettes, while the front door received the same treatment but without rosettes. 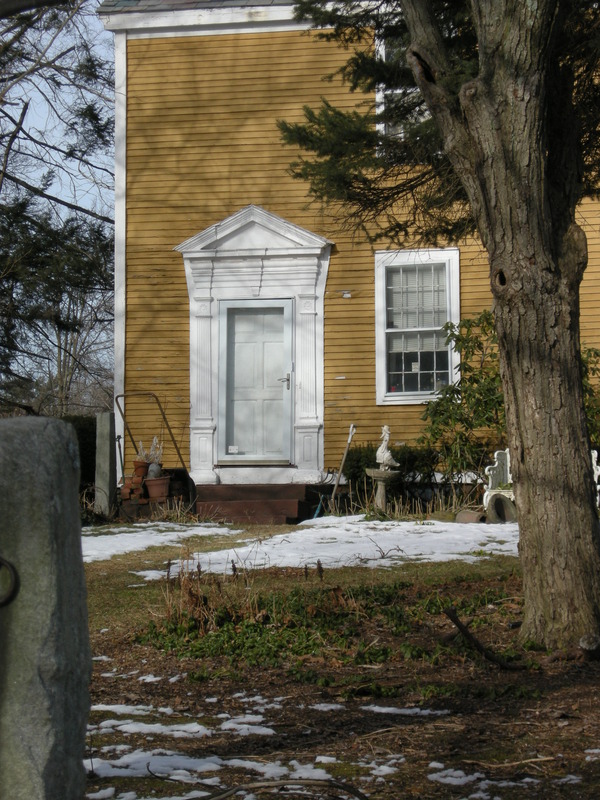 Except for one other home nearby, ours is the only one left in town to display these relics of “an 18th century flowering” along the CT River Valley, as it was called by Amelia Miller in her book on CT River Valley Doorways. First, I want to share a photo of the entrances on the other house I mentioned. The craftsmen who created these door surrounds probably also worked on ours. This particular house has the mother of all scroll pediment doorways. Besides that prize, there are two triangular pediment doorways at its side. Here is a photo I took recently of them. Now, one must genuflect, yes right there in the street, before the scroll pediment with its original double doors and hardware. You will not find a more exceptional doorway anywhere. Note the mimicking of the scroll at the pedestal base as well as in the bottom panels of the doors; the elaborately moulded entablature, foliated carvings, dentil mouldings, curve of the scroll, its carved six pointed star. It is all beyond words. There were several other houses nearby with triangular pedimented doorways, but they are now lost, as so many were in the early years of the 20th century. 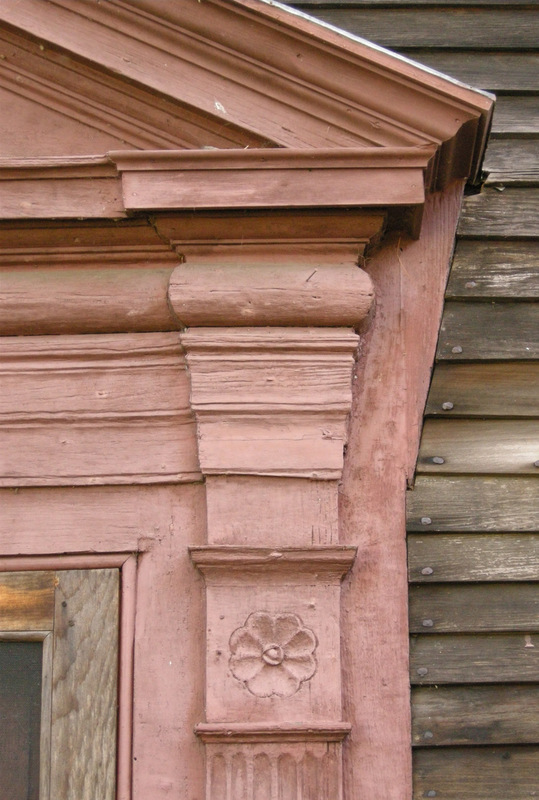 Now, only two remain, testaments to the 18th century craftsmen of the CT River Valley. A few of these men carved their way through the river valley from Wethersfield, CT to Deerfield, MA hired by the “nouveau riche” of the day, mid 18th century merchants, ministers and entrepreneurs, who could afford these services and wished to display them. 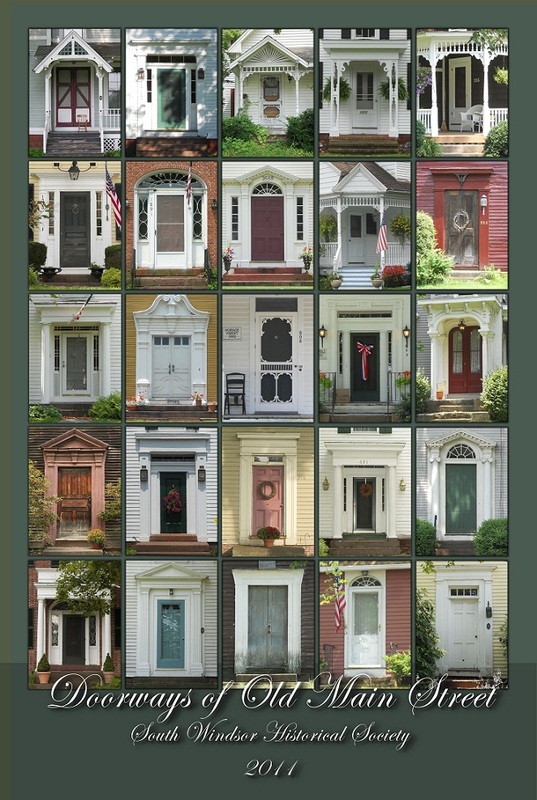 Homes along the river were embellished with scroll, triangular or flat pediment doorways by craftsmen anxious to express their creativity and display their talents, each trying to out-do the other. There would be some variation in their styles, from the angle of the pediment to the carvings in the capitals. Surely there was a healthy yet friendly competition, the fruits of which we get to marvel at today. Below is a photo of the three doorways of our own house, as found. Original doors were missing, but thanks to early photos, we would reproduce them. The two with rosettes are the matching side door surrounds, and the center one is the front. Most of the original fabric of the entrances were in tact, but along with the sills beneath them, much of their bottom sections were missing. Traces of the the design remained in outline on the backers, thus enabling us to accurately reproduce and replace them. Using a strong magnifying glass to closely view the original details in 19th century photos of the house, we were able to make out the design and panel arrangements of the original doors that were in these openings. Using old boards, that before mentioned ten dollar table saw and a few hand tools, our reproduction doors were fabricated – right there in the front room behind that CT Valley entrance. 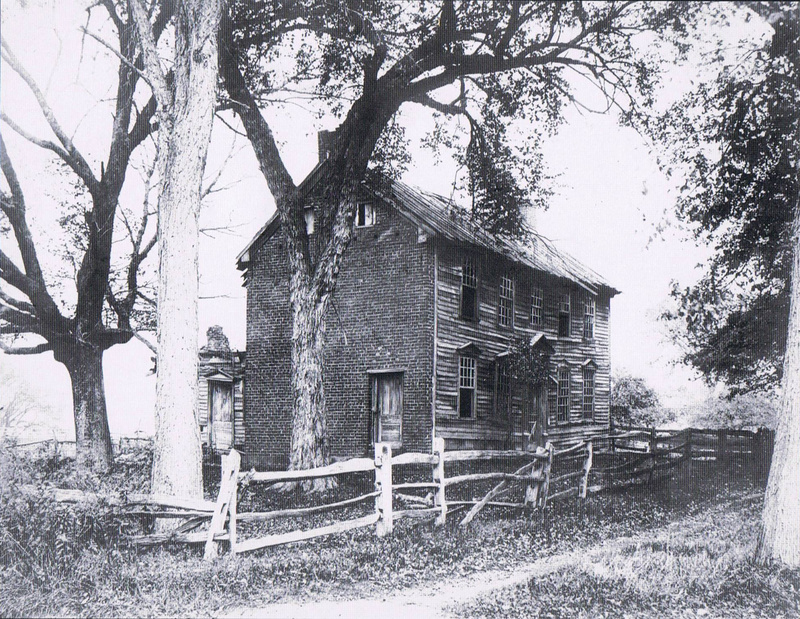 Here’s a wonderful photo of a house now gone, that once sat directly across from ours. It was truly unique with its brick ends, pedimented windows and front door. Built by Jacob and Abigail’s son, Timothy, by the time this photo was taken it had seen better days. There is a very nice lady living in the prim, white, four square house her uncle built in its place, after demolishing this one. I can’t begrudge her for it, or her uncle, as I’m sure it was times like these in which the owners found themselves without the means to maintain it. But it was certainly a gem.